I wish that I had a better picture of these brownies to show you. I got a little too excited eating the leftovers that there were no brownies left to photograph! They are amazingly delicious and you would never think that these are both wheat free and gluten free! I know that opinions vary widely on brownies... People are usually firmly either an edge piece person or an inside piece person. I am very much an inside piece person, I have no idea why anyone would buy those special brownie pans that make every piece is an edge piece! That is craziness! I also like really gooey brownies! Back in my North Carolina-Everything-Came-From-A-Box days I always way undercooked the brownie mixes so that they would be nice and gooey! Perfect for enjoying with ice cream! Now that I have this recipe I don't think I will ever make wheat flour filled brownies again! Bake in a 9×13 parchment lined baking dish for 35 minutes. Allow to cool completely. Enjoy! I found that I preferred these best straight from the fridge! You should go check out Left On Amelia too! She has lots of yummy looking grain-free recipes! 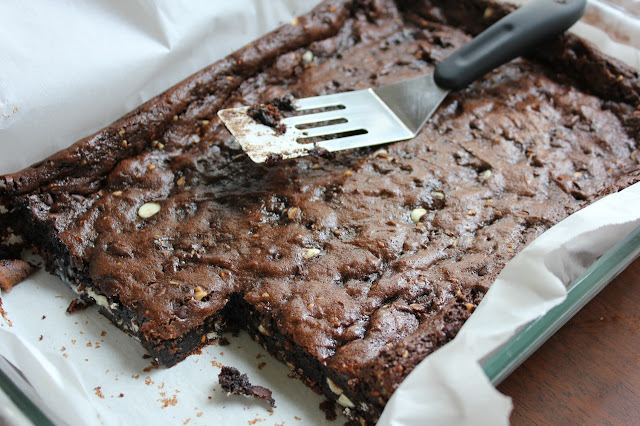 Even if you think you won't like brownies with nuts, you will love these! I am SO an "inside" brownie person! The gooier, the better, if you ask me. After making brownies with almond butter, I'll never make them with flour again! I don't know how I missed the recipe when you posted it.... But I am making them tonight. I hope I can make up for lost time here.